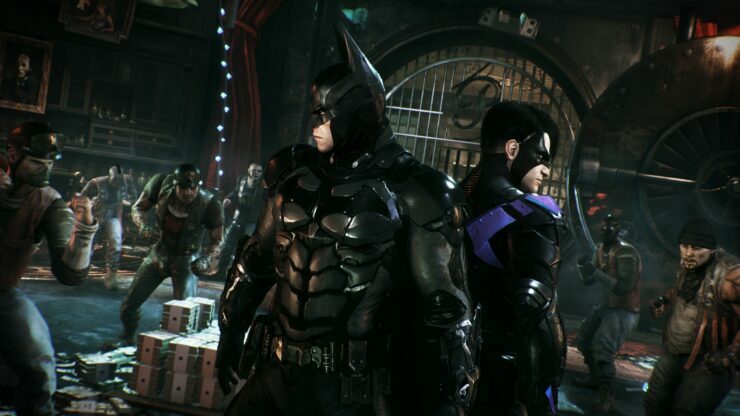 Batman Arkham Knight, the latest entry of the series created by Rocksteady now available on PC and consoles, has received plenty of additional content following its release. If you have held off due to the huge amount of DLC packs, you will be happy to know that the time to purchase Batman Arkham Knight is getting closer for you. Amazon Germany has recently revealed the not so surprising Batman Arkham Knight Game of the Year Edition, which will include all DLC packs released for the game. Among the additional content that has been made available after release are additional AR Challenges, new skins for the Batmobile, additional story chapter starring Batman’s allies and the Season of Infamy expansion, which added new Gotham Most Wanted side-missions to the main game. The Batman Arkham Knight Game of the Year edition, which has only been confirmed for PlayStation 4 and Xbox One so far, will cost €49.99 in Europe and it will release on July 28th, according to Amazon Germany. The Batman Arkham Knight Game of the Year Edition isn’t the only Arkham series release coming in the next few weeks. Next months, PlayStation 4 and Xbox One owners will be able to enjoy the first two entries of the Arkham series, Batman Arkham Asylum and Batman Arkham City, with enhanced graphics and all additional content thanks to the Batman Return to Arkham collection. Not included in the collection is Batman Arkham Origins, the only main entry of the series not developed by Rocksteady. Batman Arkham Knight is now available in all regions on PC, PlayStation 4 and Xbox One. The Batman Arkham Knight Game of the Year edition is apparently going to be released in late July on consoles. We will let you know more about this new GOTY edition as soon as an official announcement comes in, so stay tuned for all the latest news.